Quality stationary recumbent exercise bikes for in-home physical therapy are often prescribed, but the challenge is that they take up a huge footprint and isolate you to a room. 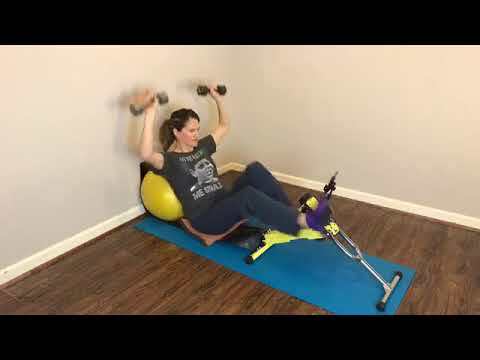 In today’s live streaming Excy workout, we use Excy as a portable stationary recumbent exercise bike from a floor cycling recumbent position. We use the Excy Keeper to prevent the system from scooting, add a ball as our “chair back” for added comfort (and fun) and use the free Excy Mobile Coach to guide us through the 15 minute Cycle Leg Blast high intensity interval training workout. We always want you to work directly with your physical therapist or doctor, especially if you are working through an injury, but make sure to show them all the functionality of Excy so they can create the best possible home physical therapy experience. Excy only weighs 14 pounds, so put it in your trunk for your next physical therapy appointment and they can walk you through proper setup on Excy as a stationary recumbent exercise bike, upper body ergometer, and much more based on their personal experience with you and your injury. They might not be familiar with Excy, but they will know the mechanics. You just might have to show them how to set it up (these videos from physical therapist will also help them). If your doctor, physical therapist, or occupational therapist has approved your rehabilitation program plan to include a stationary recumbent stationary bike, Excy is a quality piece of fitness & rehab equipment and it will take up far less space. In fact, according to both experts and consumers – stationary recumbent exercise bikes are among the most comfortable, versatile and affordable pieces of exercise & fitness equipment. We just bring a new level of comfort and convenience.